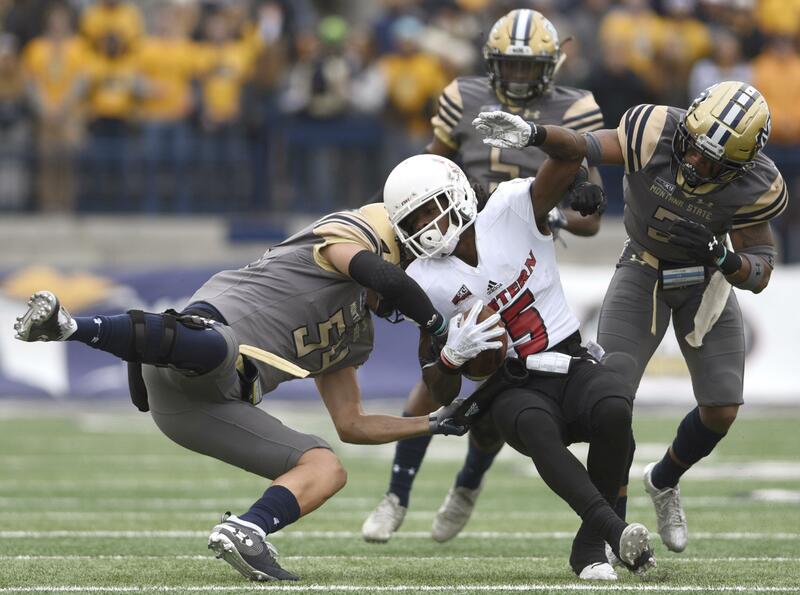 BOZEMAN – After a quarter of watching Montana State quarterback Troy Andersen shred its defense with his arm and legs, Eastern Washington put the kibosh on the versatile sophomore’s yard-churning plays. The fifth-ranked Eagles held the run-heavy Bobcats to 155 yards on the ground and quarterback Gage Gubrud passed for 311 yards in a 34-17 victory Saturday at Bobcat Stadium, EWU’s seventh straight win over its Big Sky Conference foe. Eastern running back Sam McPherson’s 57-yard touchdown run in the fourth quarter – his second of the game – put away the Bobcats (3-2 1-1), who faced a double-digit deficit the entire second half. Gubrud, who is 26 yards shy of 10,000 career passing yards, didn’t throw a touchdown pass. The Eagles totaled 490 total yards as Gubrud, McPherson and Tamarick Pierce all scored on running plays. Linebacker Ketner Kupp said EWU’s defense manufactured stops once it adjusted to the Bobcats’ throwback single-wing offense in the second quarter. Andersen played quarterback, running back and linebacker. In the early going, he excited a large, blue-and-gold crowd of nearly 19,000. He found Travis Jonsen over the top of EWU’s secondary on a 50-yard completion on the Bobcats’ first offensive play. A snap later, he ran around EWU’s defense for a 25-yard touchdown. Gubrud and the Eagles’ offense were also efficient early, scoring on their first two drives, but it was Eastern’s defensive adjustments that helped turn the tide in the second quarter. Of Montana State’s 360 total yards, 139 came in the first quarter. EWU shut down with Andersen with relentless pressure and a variety of blitzes, and the Bobcats’ offense never regained its footing. Andersen, who completed his first six passes for 100 yards, finished 12 of 19 for 156 yards with two interceptions. EWU sacked him three times and tallied seven tackles for a loss. The Eagles have held both of their conference opponents to fewer than 20 points. “Early, we were trying to find our footing, and we weren’t really in sync defensively,” EWU head coach Aaron Best said. “But then we did find our footing. We brought calculated pressure when they were forced to throw, and we put them in third and medium-to-longs. Even when the Bobcats – who often employ two quarterbacks – went to pass-first quarterback Tucker Rovig in the second half, the Eagles held him to 49 passing yards. Late in the third quarter, when the Eagles stopped Andersen on a fouth-and-2 in Eagles territory, an elated Best ran down the sideline and either high-fived or chest-bumped about a dozen of his players. Eastern Washington has won 15 of its 19 meetings with Montana State since 2000. Third-year head coach Jeff Choate, a former Post Falls High head coach, is 0-3 against the Eagles. “I thought we spotted them some things. We didn’t play with as much poise as we wanted to in the first half,” Choate said. “The most disappointing thing to me was our lack of discipline through the course of the game. We had a lot of penalties and we missed some other opportunities. Senior kicker Roldan Alcobendas had a pair of field goals and set the EWU record for career points (239) by a kicker. Published: Sept. 29, 2018, 5:04 p.m. Updated: Sept. 29, 2018, 8:44 p.m.